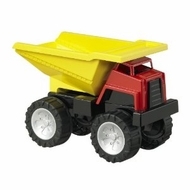 This big dump truck measures 18" x 9" x 12 1/4". Features a large tilting dump bed and a big, rugged wheels. Measures 18" x 9" x 12 1/4"